"The book of Joel tells the story of a horrible locust plague that occurred in Palestine. In this event Joel saw a sign for the final judgment and warned the people to turn back to God. Joel announced that the 'day of the Lord' was coming. It would be a time of judgment." The "Get It" section lists the author and years it was written, and explains "Why it was written: to warn us of the coming day of judgment: the day of the Lord." The "Live It" section explains what that means: "The day of judgment is real. God will judge everyone. If we say we're sorry for what we've done wrong and accept Jesus as Savior, we'll be okay." 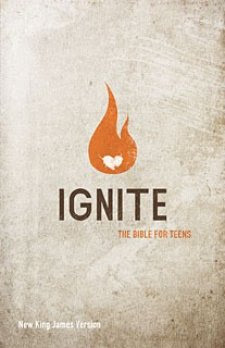 The publisher really hit the mark with Ignite. It is presented in a teen-friendly format without being cutesy or patronizing. My teen son gives it two thumbs up!